Presented here, is an excellent baked chicken for fall. 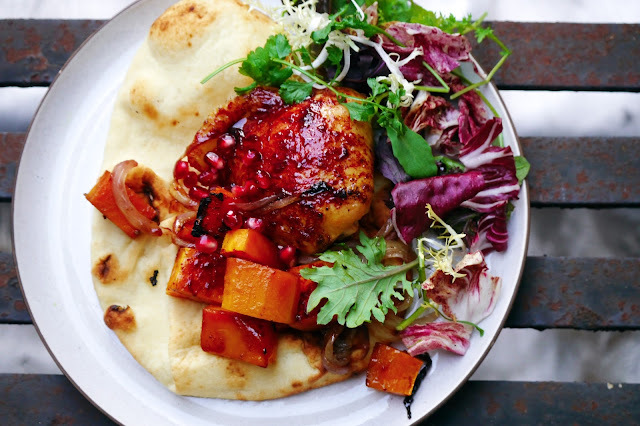 The Pomegranate/Sriracha glaze is deliberately designed to be slightly acidic in order to counter the sweetens of pumpkins. The Persian palate prefers acidity to sweetness; however if you prefer sweeter bites, add a TBSP or so of honey to the glaze. Turn on the oven and set the temperature on 450 F (230 C) and preheat. In the meantime, bring the meat to the room temperature (by removing it from the fridge). On a baking tray, layer the onion slices and put the chicken pieces on top. Arrange the pumpkin pieces in between the slices. While the chicken is being tempered and the oven preheated, make the glaze. 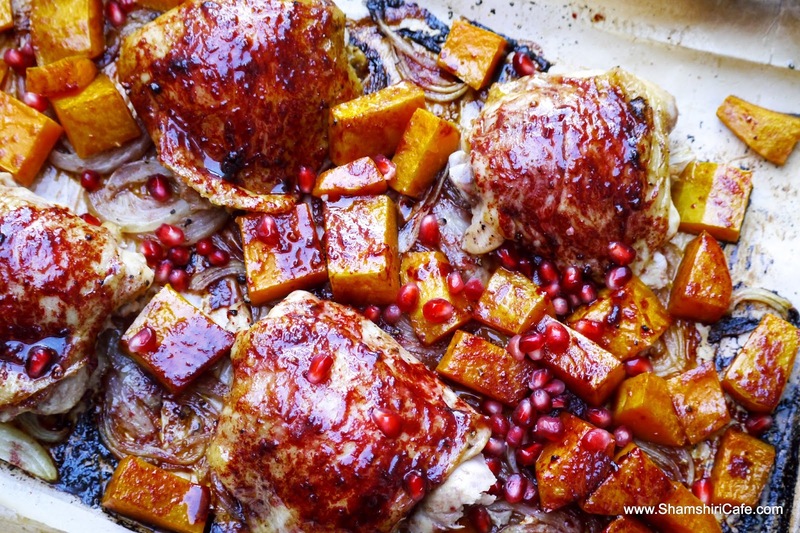 In a saucepan, bring the pomegranate juice and Sriracha to a boil and reduce to thirds. Add the lime juice [and honey]. Remove from the heat and let cool slightly. Add the cold butter and whisk to emulsify. 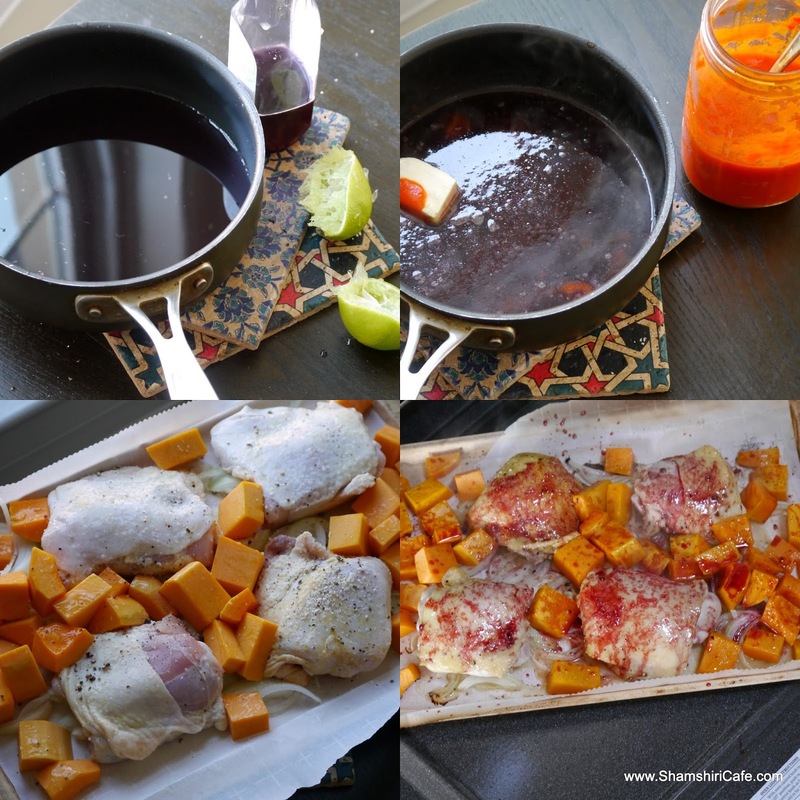 Glaze the chicken and pumpkin with half of the mixture. Bake for 20 minutes. Glaze with the rest of the mixture and cook for another 20 to 25 minutes.